The question about the origins of life, together with the investigations into minimal forms of life, is a philosophically fascinating scientific field. On the one hand it comes down to the definition of life, a terribly slippery yet fundamental question. On the other hand some of the most philosophically relevant properties of our world are already present in minimal life forms and can be precisely (i.e. empirically and formally/computationally) addressed in this field. Such properties are (among others): individuality, normativity, agency, evolution and information. 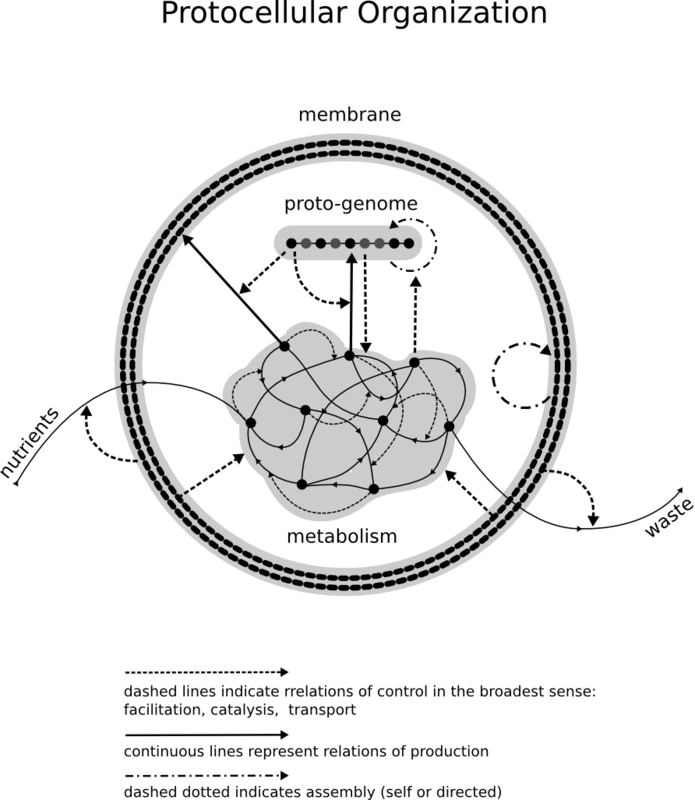 Diagram of minimal living organization: a membrane encapsulating a metabolic reaction network that selectivelly uses a template molecule to produce catalysts for its own regulation. The picture above captures a diagrammatic representation of a minimal protocellular system, relationship between arrows gives rise to the foundamental properties required to ground normativity, agency and individuality. Agains replication based groundings of agency (Dawkins 1978) and evolutionary accounts of function and cognition (Millikan 1986) I defend that the origin of agency is better captured at the level of organizations, i.e. of specific types of arrangements between components of a system. In particular living systems (even the most minimal ones) are autonomous organizations: they maintain their own structure through their own continuous far-from-thermodynamic-equilibrium activity, distinguishing themselves from their environments. The phenomenologist Hans Jonas, considered metabolism to be at the core of phenomenology and pictures living systems as in a permanent state of precariousness, free from specific material constituents but equally in a continuous need to assert their otherwise decaying identity. It is the regulation of their precarious conditions of existence what imbues living organization with an agentive nature, unlike “self”-replicating inert molecules (like DNA) that resemble more a template scaffolding of a complex body than the source of its agency. More recently, together with Matthew Egbert and Ezequiel Di Paolo, I have been exploring the evolutionary implications of metabolism-based agency (i.e. behavioral patterns that are controlled by metabolic dynamic): we have observed that interesting positive feedback effects can be established between the norms (requirements and possibilities of survival) that emerge from metabolism and its direct influence on behaviour. We have termed this process as Behavioural Metabolution. Egbert, M., Barandiaran, X. and Di Paolo, E. (2010). Behavioral Metabolution: Metabolism Based Behavior Enables New Forms of Adaptation and Evolution. Alife XII: Proceeding of the 12th International Conference on Artificial Life, accepted. Edgbert, M., Di Paolo, E. and Barandiaran, X. (2009) Adaptive Behavior of a Motile Protocell Sensor-less sensitivity to emergent viability conditions. European Conference on Artificial Life 2009, accepted. Barandiaran, X. & Moreno, A. (2008) Adaptivity: from metabolism to behavior. Adaptive Behavior 16(5): 325–344. Moreno, A. & Barandiaran, X. (2004) A naturalized account of the inside-outside dichotomy.PHILOSOPHICA 73: 11-26.